A Boy And His Record Player. Of course in December 1963 I was not the only one who had caught the Beatle Bug. There were 4 new 7″ records to play & half of them were by the Fabs. The current #1 hit “I Want To Hold Your Hand” (“She Loves You” was still at #2), “This Boy” on the flip side, looked sharp in its familiar green Parlophone paper jacket. 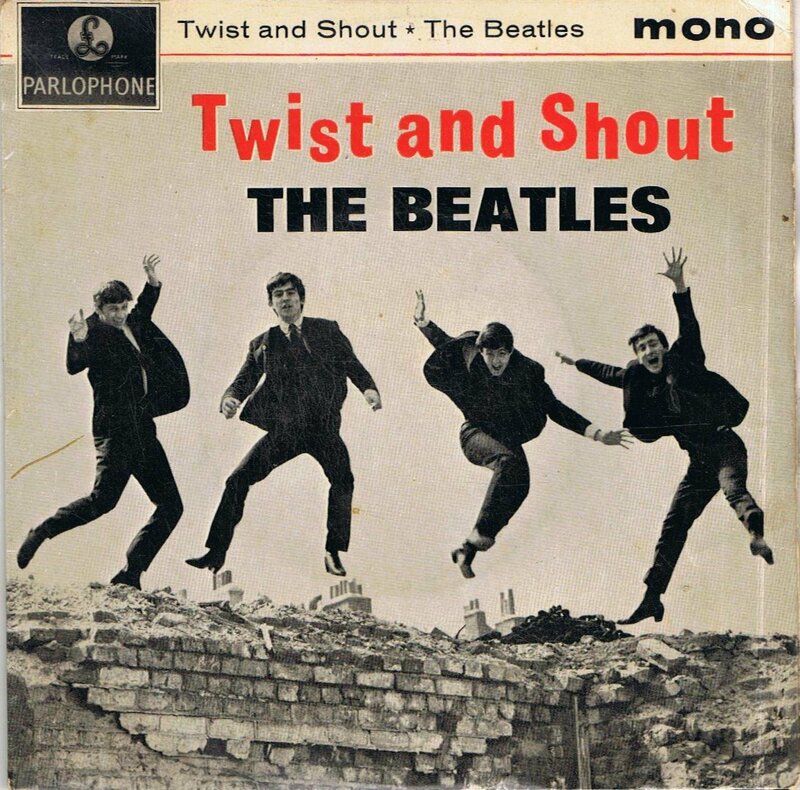 The “Twist & Shout” extended play, 4 tracks from the debut LP “Please Please Me” with a photo cover & its wonderful, raucous title track. The other 2 E.P.s were part of the Mersey Mania too, 4 more McCartney-Lennon songs by Billy J Kramer & the Dakotas &, for my younger sister, a Freddie & the Dreamers selection. Music was not a big thing for my parents, they were old anyway, Mum was 30! They were however sussed enough & kind enough to realise that it took more than just 4 discs to make a record collection. They found somewhere, a second-hand shop, a friend, y’know I never asked, a stack of around 25 very assorted 45s from the early years of the decade. 1963 may have been my Year Zero, when all that came before was suddenly old-fashioned, but there were some classic tunes in the pile, ones that showed that “Love Me Do” possibly wasn’t the start of it all, that were played many times & are still favourites. “Palisades Park” is the story of finding love in a New Jersey amusement park told in under 2 minutes. With its rocking arrangement featuring a distinctive hurdy-gurdy organ, screams from the roller coaster, descriptive lyrics energetically delivered by Freddy “Boom Boom” Cannon, this record, originally a b-side, is sharp enough to shave a sleeping mouse without waking her! British travelling fun fairs were exciting enough, the chance to win a goldfish, tattooed love boys spinning girls on the Waltzers or standing up on the Speedway, the first place I heard our new music played as loud as it ought to be. 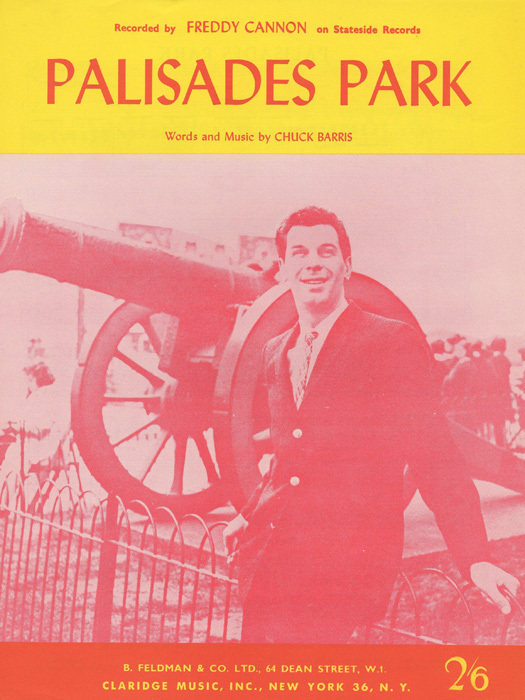 I could only imagine what “a swinging place called Palisades Park” was like. “You’ll never know how great a kiss can feel till you stop at the top of a Ferris Wheel” Well actually I do now & she thought it was pretty romantic of me. Freddy Cannon put me on it, thanks man. The song was Freddy’s third million selling record. Written by Chuck Barris, later the host of US TV’s “The Gong Show”, it was one of a string of stomping Pop-Rockers. I was not the only one listening to Freddy & I can drop an impressive list of names to prove it. In 1981 the great American comedian Andy Kaufman starred in an episode of “Midnight Special”, he introduced Cannon as “one of the most creative forces in 1950’s Rock & Roll”. Freddie performed “Tallahassee Lassie” his first hit from 1959, a thunderous version of which was included in Peter Green’s Fleetwood Mac’s live set & was covered by the Flamin’ Groovies in 1972 then by the Stones on the 1978 “Some Girls” sessions. In 1988 “Palisades Park” came round again when Bruce Springsteen & the E Street Band included it in their set then, in the following year, the Ramones recorded their own version. Heavy hitters all & they got good taste. 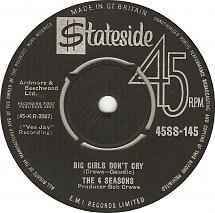 Now I did know “Big Girls Don’t Cry” by the Four Seasons, who didn’t? After a couple of years of trial, error & different names the vocal group got it right in 1962 when “Sherry” was a US #1 & a worldwide hit. Guided by producer Bob Crewe who wrote the songs with group member Bob Gaudio they repeated the success with “Big Girls…” & “Walk Like A Man”. 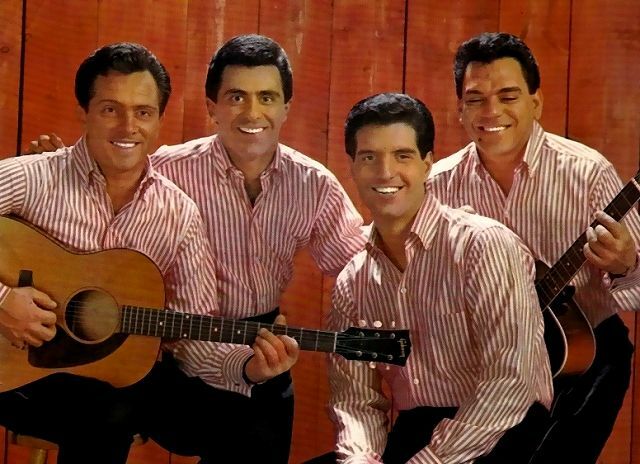 The 4 Italian-Americans from New Jersey & New York updated 1950’s Doo Wop into Teen Pop, blending propulsive drum beats with smart vocal arrangements showcasing the unique falsetto lead of Frankie Valli. “Big Girls…” like all their singles was artfully crafted to be instantly memorable. A new Four Seasons record came on the radio you knew who it was, you listened & millions bought them. The hits just kept on coming despite the British inundation of the charts in 1964. Vee Jay, their record label, hit financial troubles, swamped by the demand for Beatles & Four Seasons records. A move to a bigger concern soon added “featuring the “Sound” of Frankie Valli” to their name. With an ear to the changing times they released Dylan’s “Don’t think Twice It’s Alright” under the pseudonym The Wonder Who? No one was fooled, Valli’s voice was too distinctive & it made the US Top 20. Everyone has a favourite hit song of theirs, mine is the Spectoresque “Rag Doll” because I’m a sucker for Baroque arrangements & “sad rags to glad rags” stories of girls from the wrong side of the tracks. (Whatever & wherever that may be). 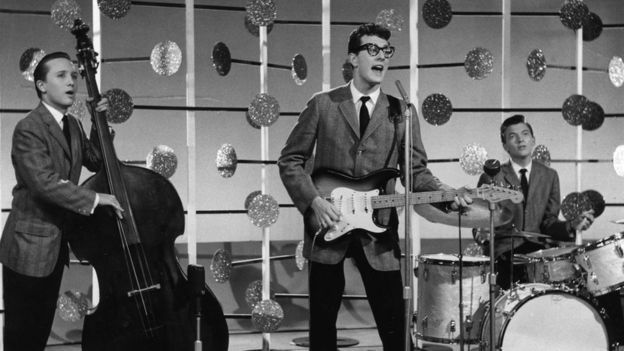 In 1963 I didn’t know much about Buddy Holly & the day the music died in February 1959. I was sure that this disc, the infectious “It Doesn’t Matter Anymore” teamed with the sad & beautiful “Raining In My Heart”, was a serious piece of kit, evidence of a striking talent. Over the following year the Rolling Stones had their first UK Top 10 hit with the shave & a haircut Bo Diddley beat of Buddy’s song “Not Fade Away” while the Fabs included his more delicate “Words of Love” on “Beatles for Sale”. Buddy Holly was not the only artist from the Olden Age of Rock & Roll introduced to me by these two eminent groups. Prompted to further investigation I discovered that “It Doesn’t…” was a posthumous hit for him. In just 3 years of recording before he died in that tragic plane crash at just 22 years of age the young Texan & his band, the Crickets, epitomised & defined the new music. On “That’ll Be The Day”, “Rave On”, “Maybe Baby” & more, it’s a list & I’ve missed out your fave) there’s a teenage exuberance, rocking but still melodic music for & by a new generation. It was obvious how much pleasure I found in music & Dad put out the word at his work, a massive steel plant employing thousands, that any unwanted records would be welcomed at our house. That’s how I took possession of a pile, like hundreds, of 10″ fragile shellac 78 rpm discs (a rotating stylus revealed a needle to play them). 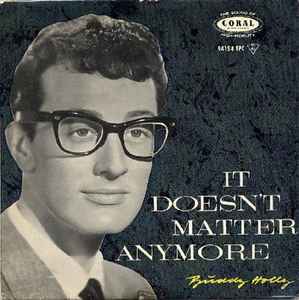 They were not all to my taste but “Peggy Sue”, Buddy Holly’s hit from 1957, was a marvel. Repeated plays of this record did not dim my wonder at the urgent paradiddle percussion of Jerry Allison, Holly’s idiosyncratically yelped vocal & the wild, perfect 15 seconds of strummed guitar that can hardly be called a solo. What technological alchemy captured such enthusiasm & imagination so faithfully in the groove of a record? If you are too young to know Buddy Holly’s music then you know the drill. This Xmas, 55 years after Santa came through, I was with my sister & 3 brothers & mentioned that I was writing my memories of our old Dansette. Each of them nodded & smiled with approval. When I left home at 18 the record player stayed & the younger ones, with big brother out of the way, were able to make their own musical discoveries. We were by no means poor but there was not a lot of spare cash around. It must have been a stretch for my parents to spring for such an expensive present & so kind of them. I know for sure that its arrival changed my life & that it brought much, lasting pleasure to all the family. Yeah, I think we did get our money’s worth from that lovely thing.